Last Friday Hong Kong reported an H5N6 Positive Chicken Carcass Found On Lung Kwu Tan Beach, along with three other badly decomposed carcasses. 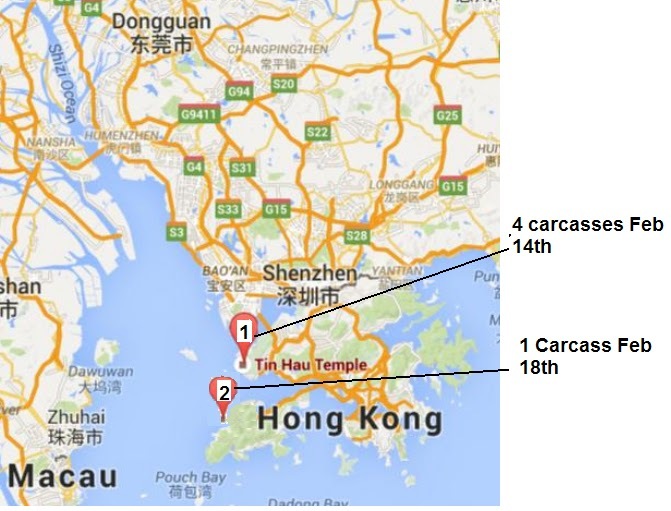 Today, the discovery of another H5N6 infected carcass has been announced, picked up in the waters off Lantau Island. 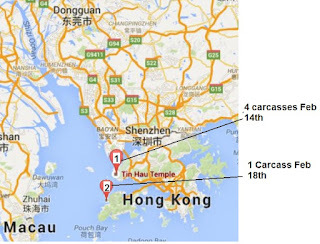 In previous years (2009-2012) we've seen similar reports - albeit with the H5N1 virus - badly decomposed poultry carcasses washing up on the beaches of Hong Kong, presumably carried to the sea via the Pearl River, which flows out of Guangdong Province, China. The assumption - never proven - was that farmers with infected flocks were doing some clandestine dumping of dead or dying poultry rather than reporting outbreaks to local authorities and risking a greater cull. Given the size of the Pearl River Delta's outflow, and the expanse of the Zhujiang River Estuary, any recovered carcasses likely represent only a fraction of the total dumped upstream.